The following stories have been sent in by visitors to this site, prior to 2010. 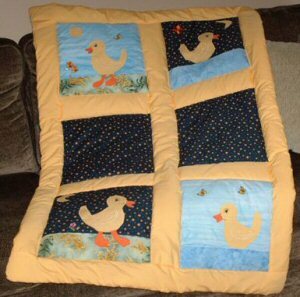 Please feel free to share Your Quilting Story on my Facebook wall! I have found so much useful information on your web site and want you to know how much I appreciate it. I have made notes and requested copies of some of that information and am making a "Quilting Information Guide" quilt book for myself. I have recently been teaching myself to sew and quilt and I need some sort of handy reference I can grab for quick quilt answers. 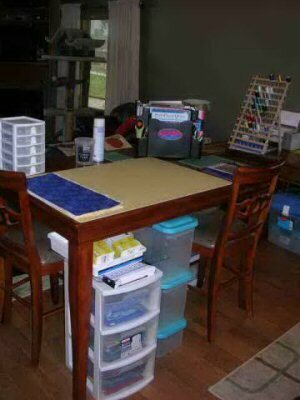 You quilting and sewing tips archive was insightful and I have written some notes for supplies and tools to gather for my sewing corner. I'm glad there are web sites out there like yours. We newbies surely find them useful. 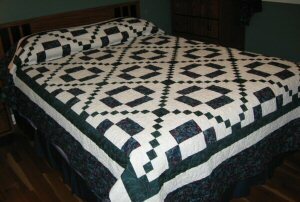 Here is a pic of my first quilt. 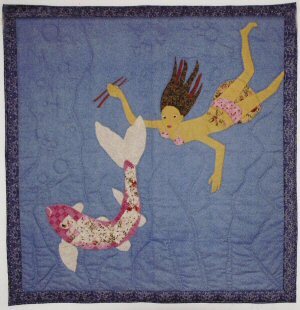 Challenge name "Sushi": I quilted a swiming Japanese girl in an aquarium to try catch a fish with wooden forks! I was not selected.....next time perhaps! 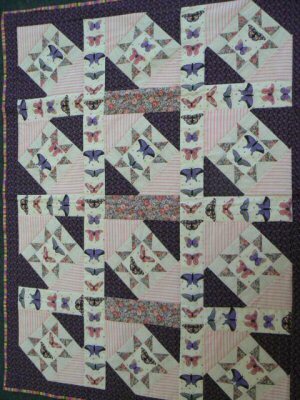 I'm a fan of your website and wanted to let you know that our quilt club, Mountain Laurel Quilters of London KY participates in making quilts, blankets, and afghans each month for Project Linus. One of our members, Paula Philpot, donates her quilt shop class room for our sewing sessions on the second Tuesday of each month. Another of our members, Pat Klink, is the Project Linus coordinator for this area. We have made almost 400 blankets since the beginning of this chapter. We have several ladies that show up each month to cut fabric, sew, clip, tie, crochet or knit a blanket/quilt/afghan. 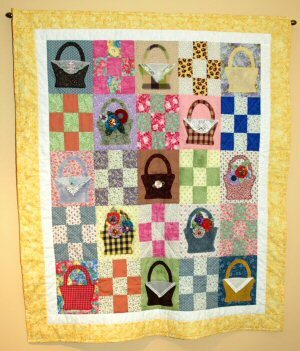 Paula's quilt shop is named Paula's Quilting Pantry, located in East Bernstadt, KY. We have such a good group of ladies that participates in this project and are always gaining new faces. We would like a new pattern for a project, if you have something available. We usually work with flannel, but occasionally have something else to use. 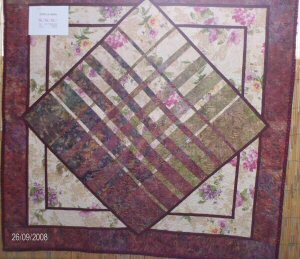 I like the scrap quilt shown on your website. Our club's website is www.mountainlaurelquiltersclub.org which includes a link for Project Linus. We are having a quilt show Oct. 16-17, 2009 in London which will include a LIVE AUCTION, benefiting Project Linus and other charitable events of our club. 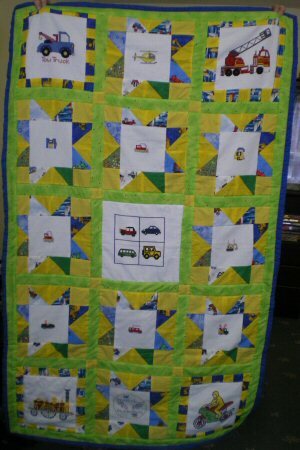 Finishes the quilts and then donates them to a children's hospital. 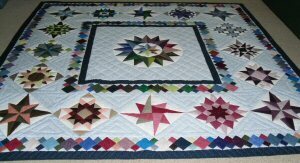 This is a quilt I made for my great nephew for his 5th birthday. I made 130....6½" blocks and ended up with this design. so I used it on the border and some of the strings. Now I'm making a quilt for his 3 year old sister but it's not a scrappy quilt. 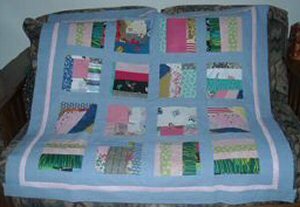 I've always loved to make scrappy quilts. They are also like a memory quilt. Just finished this quilt last month. 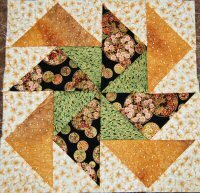 Note: Donita used the same colour fabric in the centre of blocks which 'defines' the blocks when all are sewn together...Great idea! Kelli's Oriental Delight...For my granddaughter's engagement present. Just recently painted our bedroom and of course had to make a new quilt and curtains to match. 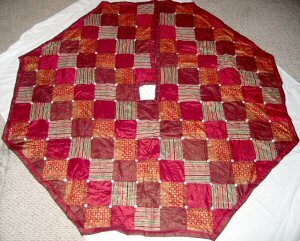 This a picture of the quilt and the back. It's pretty well reversible. I am a beginner quilter. 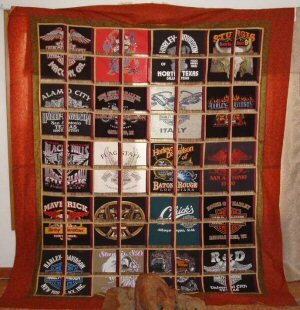 The first thing I made was a baby quilt, then a table runner, then this Harley t-shirt quilt. This shows how close my various stations actually are and how convenient. 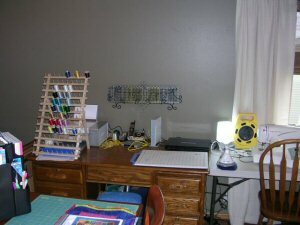 You can see how I put the Desk Apprentice to work and also, how my quilting rulers are stored on the plate display on my wall. 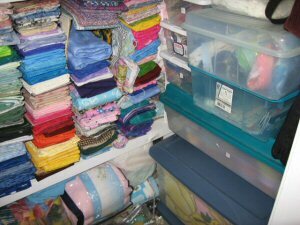 I have storage bins under my cutting area for all my fabrics. I didn’t have enough plugs handy, so I added more with the yellow extension cord/plug in thing. Nice, technical term, don’t you think? I also have a pair of “happy” lights on my sewing table. They are supposed to help fight depression I guess. I thought they would be good for really putting some light right where I needed it and guess what? It makes me happier! LOL I found these at Costco. The Quilters Hall of Fame (TQHF) is pleased to announce the selection of Jean Wells Keenan of Sisters, Oregon, as the 40th Honoree to be inducted into the Quilters Hall of Fame. Induction will take place in July 2010. Jean Wells Keenan has been active for almost three decades as a noted quiltmaker, author, show-designer, teacher and entrepreneur. Staying on top of a fast paced and changing retail business for three decades, while working successfully to pass responsibility on to the next generation, is one of her outstanding accomplishments. In 1975 Keenan opened one of the first quilt shops in the U.S. and simultaneously hung the first Sisters Outdoor Quilt Show, hanging just 12 quilts that first year. 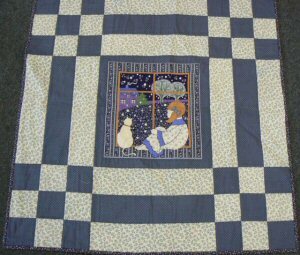 In 1980 the Quilters Affair was added to the Quilt Show events, offering a wide variety of classes and workshops to the schedule. Today more than 1200 quilts and some 1600 students come in from all over the world, requiring 3,000 hours of help from some 800 plus volunteers – in a town of only 1300 citizens. Keenan has set the bar high in how to enroll a whole community in the wide-ranging benefits of quilting. The Sisters Outdoor Show has become a community-supported event– bringing an estimated 15,000-20,000 visitors in one weekend. The show is supported financially by the community of Sisters – almost every merchant in town being a Show sponsor and hundreds of citizens volunteering, from young people to grandparents – most not even quilters. The Sisters Area Chamber of commerce honored Keenan’s commitment to the community by presenting her the Business of the Year Award in 1999 and Citizen of the Year in 2008. In addition, Keenan helped set up a non-profit corporation to manage the show and related events for the benefit of the Sisters community and school groups, and to educate the public about the art of quilting. Keenan has been a vital part of and a major player in today’s evolving “quilt world,” with its far-reaching impact on commerce, manufacturing, and technology, as well as on the beauty and aesthetics of this well loved art form. She has traveled around the world to teach both quilting and the business of successful quilt shop management. In 1998 Keenan was named recipient of the Michael Kile Award for Lifetime achievement, the highest award that the quilting business industry gives, and was the first quilt shop to be inducted into the Independent Retailer Hall of Fame in 1997. Keenan has had a life-long commitment to education, earning her BS in Home Economics Education from Oregon State University, 1965, then her MS in Guidance and Counseling from Portland State University, 1969. She taught high school home economics from 1965-1973, the last four years as Home Economics Chairman for the Beaverton, Oregon School District. Please join us in celebrating Jean Wells Keenan’s induction by joining us in July 2010 for lectures, workshops, multiple quilt exhibits, vendors mall, tours of The Quilters Hall of Fame and special Induction Ceremonies. For additional information about The Quilters Hall of Fame's Celebration, July 15-18, 2010, please visit the website. The St. Joseph Quilters outreaches to the Lazarus House Ministries in Lawrence, MA.... a most worthy outfit.... and our primary gift focus is to homeless children which is why most of our quilts have children friendly themes. Last year I entered a quilt show for the very first time and it was a great experience. I would encourage other quilters to give it a try. These are two quilts I made. The chilli one I designed myself and the other is inspired by a shoo-fly block which I saw in a book. 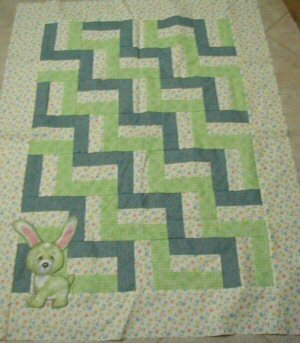 Here is a baby quilt I recently finished. My eyes of night see only black and white. my cotton soldiers rank and file await inspection. As I survey those greens and blues in middletones are one; the multishades of grey. Squares of anonymous white absorbing light step forth to twinkle. This is my hour of command, in silence I stand. I gaze and re-arrange my men. Until they satisfy my inner eye. And march them in formation. I made these window treatment for our kitchen. 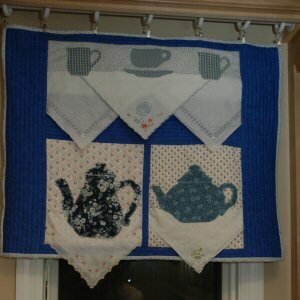 I appliqued the tea pots and tea cups. I also used hankies as little table clothes. 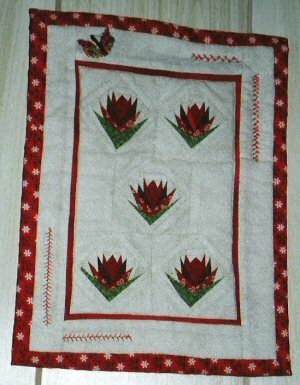 I collect vintage hankies and I try to use them in quilts. 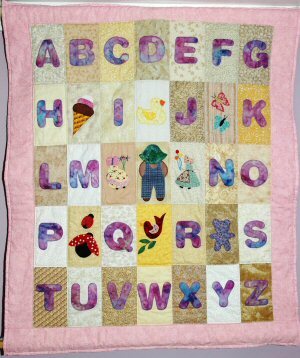 Here is an ABC quilt for a baby boy. I designed it myself. I did have the pattern for the little boy in one of my quilting books. 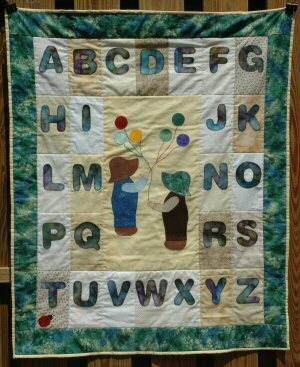 The letters and the little boy are appliqued. I use fusible web in my appliques. The work goes faster that way.I am now working on an ABC quilt for a little baby girl. 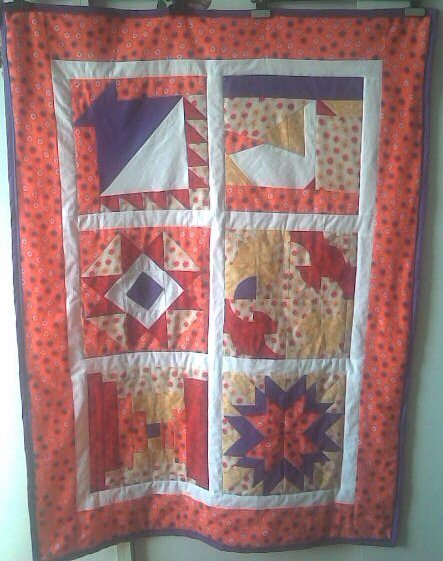 One more quilt. I got the pattern from one of the quilting magazines I have. I have a nice collection of books and magazines. Yo Yo flowers in some of the baskets. Also decorating the flowers and baskets are Ladybug buttons. I happen to love Ladybugs. 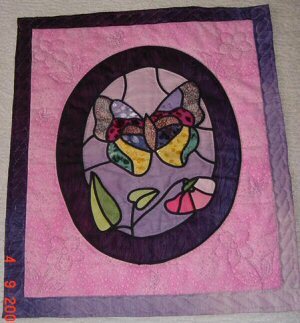 I now try to add a Ladybug to each quilt I make as part of my signature. 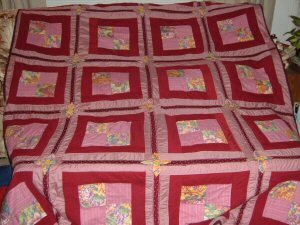 I am only quilting for the past 3 years, I am still in the learning process. My husband Stu is a bit of a handyman. He loves tools and has a collection of power tools. He did several renovations to our house. I found these tools fabrics online and made him a quilt for his birthday two years ago. It was a big hit. 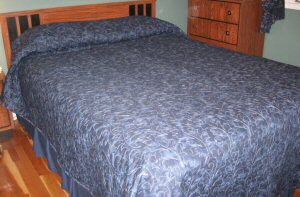 Stu uses this quilt in the family room on cool winter nights when he watches TV. 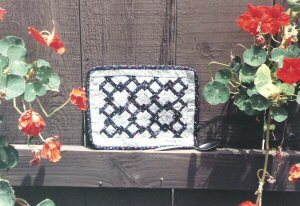 I found the pattern for this little wall hanging in a quilting magazine last summer as well. You can see how much I love the Sunbonnet Sue and Sam. This is one of my works. The name is "Oltre la grata". 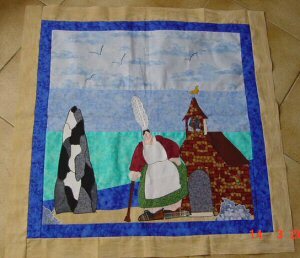 This is the picture of the church quilt for 2009. 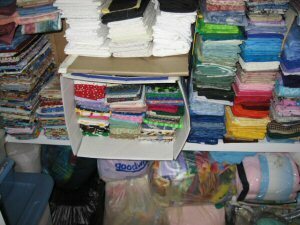 Just yesterday I finished reorganizing my fabric stash of 15 years. I'm a crafter that sells at craftshows and also a quilter and teaching my granddaughter to quilt. So my room is usually pretty messy and you can't even walk in it by the end of the year, as I tend not to put things away when cramming for the shows. The first couple months of the year is spent cleaning everything up (this year I'm about a month late). 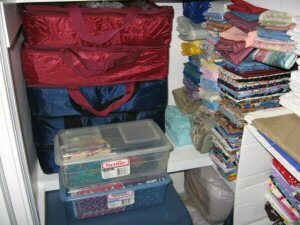 I'm lucky, I have a walk in closet that has all shelving and that's where I keep my fabrics. I will post pics at the end of this. I organize by topic and also by color. I use cardboard boxes on the shelves as they're easy to replace and free. I use sizes to fit together like a puzzle. 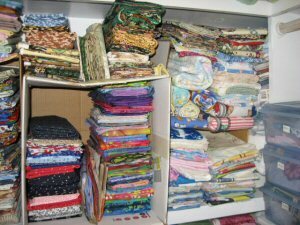 Seperates categories, keeps fabric from falling when I reach for a pile, and very easy to see and get to everything. 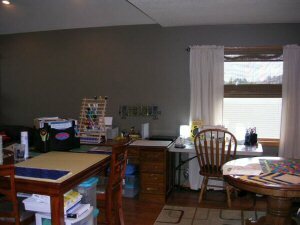 I then listed everything on a notepaper (left to right for all 3 shelves and tacked to inside of closet. Tells me exactly where to look right away. The bins on the floor are all fleece and all my fat quarters are in fat quarter cases on the shelf. I got rid of a ton of scraps this last couple of months by grabbing a pattern and cutting it out and putting it in a ziplock...cut out 60 quilts and all are different patterns (remember, I only do one-of-a-kind things) and cut into the kits and inbetween everything else, I grab one and do it really quickly this way. 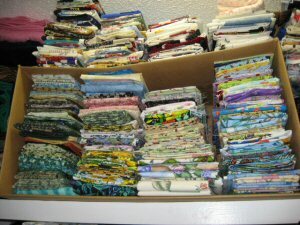 Lots are going to be donation quilts and some I will sell and some I will keep. So, if I can organize, anyone can! Just thought I'd post this in case it might help someone else. This is the Sunbonnet I made for Madelyn for Christmas and I made pillow shams to match, too. 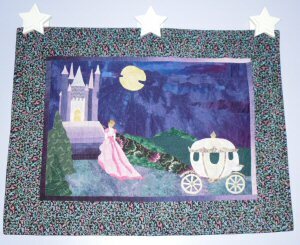 I also made her the Cinderella wall hanging for her 4th birthday in September, 2008. I hand pieced and hand quilted it. Hello again from south west of France near Toulouse. These are my latest "chef d'oeuvre". 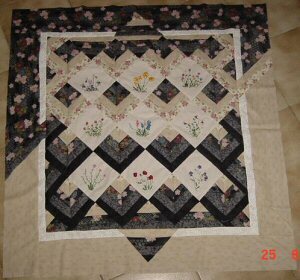 I cannot stop quilting, it's a virus, but this is a great pleasure to work in my club. 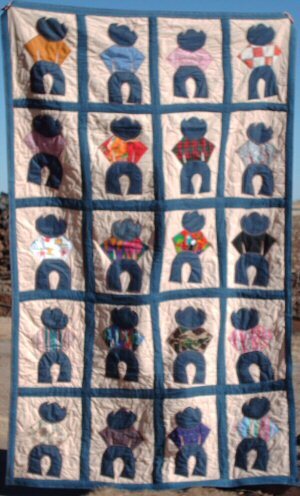 Way back in 2007, I submitted a picture of a quilt for my son and his wife. It was delivered to them at Christmas 2007. When their youngest daughter saw it, she asked her Dad if Grandma would make her one. So, I'm submitting one block in a picture. I had started it in February, 2008. Then hurt my shoulder and was unable to work on it until recently. I finished the top, went shopping for the batting Saturday November 21. Put the 3 pieces, top, batting and lining together and was able to get into the frame, November 22. Started quilting November 23. There are 20 - 20 inch blocks plus the sashing. 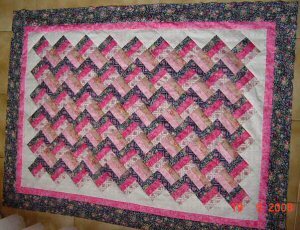 I have quilted 13 block and the sashing between each. It will be finished by December 13 except for the binding. Another picture of the finished product will be sent at that time. 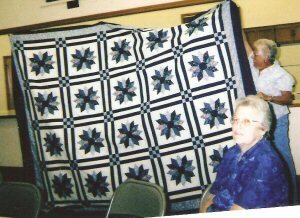 The quilt I displayed in 2007 was the king sized in shades of blue. When my granddaughter saw that quilt I had made for her Mom and Dad she asked her Dad if he thought Grandma would make one for her. Of course, I told my son yes. It would be a Christmas present for her this year, 2008. This is the picture of "Sarah's Request". It is 82 inches x 98 inches. A set of 20--4 patch blocks in vintage fabric with solid mauve and burgundy log cabin around the 4 patch blocks. This is a very unique quilt. It is unique, as you can tell by the quilting that the log cabin doesn't always face the same way. After this one, I have 2 more to make. One for my youngest daughter and one for Sarah's sister Kelly. I turned 80 years old April 27, 2008. 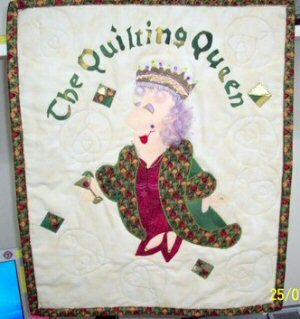 I have been quilting since I was a young girl. I was taught by my mother. 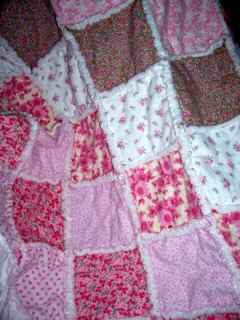 She made many beautiful quilts. One for each of her 4 daughters and 3 sons. It was on her quilting frame that I learned. 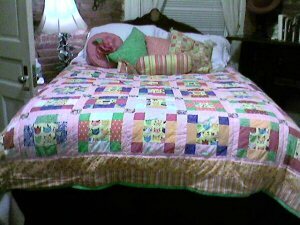 My father had made the adjustable frame to hold a regular size bed quilt. It was made out of 1 inch by 2 inch lumber. Each piece had holes drilled in it about an inch apart. There were 4 pieces and I'm guessing the 2 longest were about 90 inches long and the shorter ones about 48 inches long. He had attached hooks to the ceiling of the room with ropes attached to make the quilt just the right height for a lady to sit in a chair and quilt. 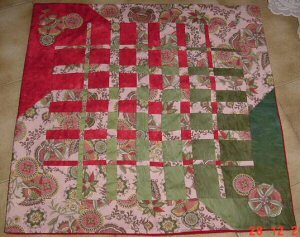 The quilt was attached with heavy string threaded through the holes and into the quilt of the long planks. 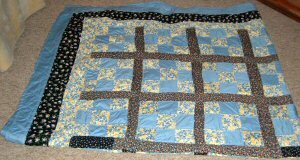 Since the four planks were clamped together, the longer sides with the quilt attached was rolled from each side so the quilting started at the middle. This would easily allow 8 quilters, 4 on each side. As that portion of the quilt was finished, one side was rolled so the next section to be quilted was visible. 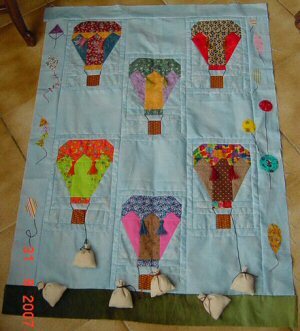 After that end was quilted, the quilted portion was then rolled until the other end of the not quilted portion of the quilt was shown. 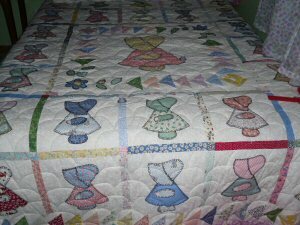 When all was quilted, it was Mom's job to make sure every portion of the quilt was finished. Occasionally, she would find that someone would leave out a few stitches around a flower, etc. She, of course would correct it. When she was satisfied, the quilt was removed from the frame. A binding was sewn all around on the lining side of the quilt, then turned into the front and hand stitched all the way around. The stitches were tiny and very well spaced. The batting was pure cotton. When washed and hung on the line to draw, the batting would plump up. Oh, what a beautiful sight. Merikay Waldvogel, one of the key players in the late 20th century quilt history revival, has served on the board of directors of both the American Quilt Study Group (AQSG) and The Alliance for American Quilts (AAQ). She has been a key player in building The Alliance's online Quilt Index. She has also taken key roles in the Boxes Under the Beds and Quilt Treasures programs that are major contributions of The Alliance to the study of American cultural history. 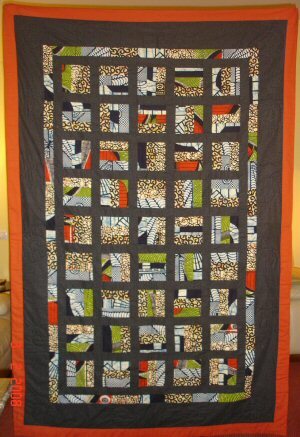 Waldvogel is a fellow of the International Quilt Study Center (IQSC) at the University of Nebraska-Lincoln, where she has worked with graduate students and has built an important database of quilt kits. 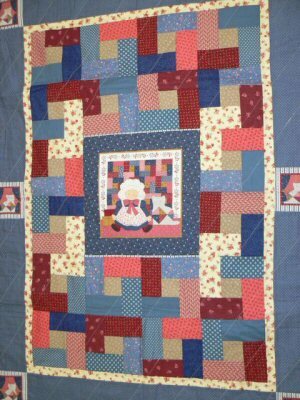 In 1983 Waldvogel began her collaboration with TQHF Honoree Bets Ramsey to co-direct the Quilts of Tennessee project through its mission of documenting the quilts of that state. Together they wrote the book Quilts of Tennessee: Images of Domestic Life Prior to 1930, and put together a traveling exhibit, one of many exhibits Waldvogel has curated over the years. They later collaborated on the book Southern Quilts: Surviving Relics of the Civil War. 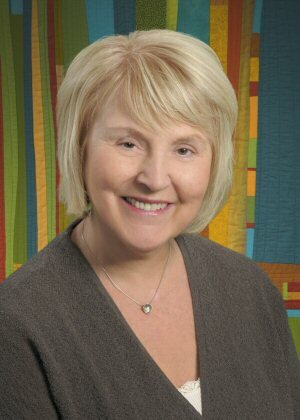 In 2003, Rosalind Webster Perry and Waldvogel co-edited the first book of articles about the honorees, The Quilters Hall of Fame. In addition to serving quilt history organizations, Waldvogel is recognized as an expert on quilts of the twentieth century quilt revival. Her own book Soft Covers for Hard Times: Quiltmaking and the Great Depression is the key work on mid 20th century quilts and quiltmaking. Her collaboration with 2001 Honoree Barbara Brackman on Patchwork Souvenirs of the 1933 World's Fair was a major contribution to quilt research. Her Uncoverings articles for AQSG on Southern Linsey Quilts, the WPA Milwaukee Handicraft Project, the Anne Orr Studio of Nashville, Round Robin Pattern Collecting, and the early history of Mountain Mist patterns were all groundbreaking research. Her latest book Childhood Treasures: Doll Quilts By and For Children highlights Lincoln, Nebraska quiltmaker Mary Ghormley's extensive doll quilt collection. 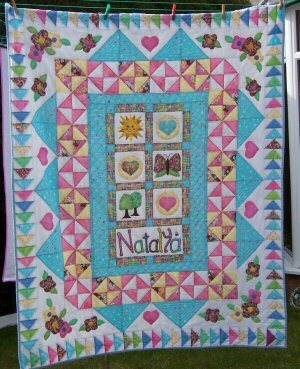 Waldvogel has written for Quilters Newsletter Magazine, McCall's Quilting Vintage Quilts, American Patchwork and Quilting, and Quilting Today/Traditional Quiltworks. In the Southeast, she is known for her writings about Southern women and their quilts in Appalachian Life and Smokies Life magazines. She also lectures frequently to quilt guilds, historical societies, and museums in the area. Merikay Waldvogel is a graduate of Monmouth College in Monmouth, IL and the University of Michigan in Ann Arbor. She was raised in St. Louis, Missouri, but now resides in Knoxville, Tennessee. For additional information about The Quilters Hall of Fame's Celebration, July 16-19, 2009, please visit the website. 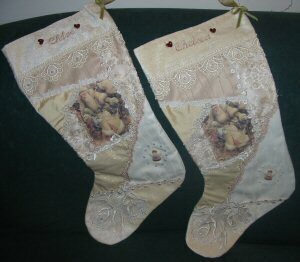 I made these Crazy Christmas Stockings using your Crazy Quilting Technique. Here's my Baby Rail Fence I made from your pattern. I added a sleepy bunny to the bottom. I have started quilting 2 years ago. Here are two of my projects. I'm Aunty Jane. I live in the pretty city of York in the UK. My story and my passion are one and the same ... i run a stitching charity making bibs, quilts and knitted garments for children and babies in need..... my story is a long one but i first started in 1995 by making bibs for profoundly disabled kiddies who often didnt make it to the age of 10 years old. This led on to quilts and then on to founding our charity group. 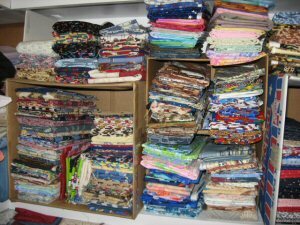 We now have over 120 members making garments and quilts from cross stitched squares and donated fabrics. Summer is almost over but our will to quilt lingers on. 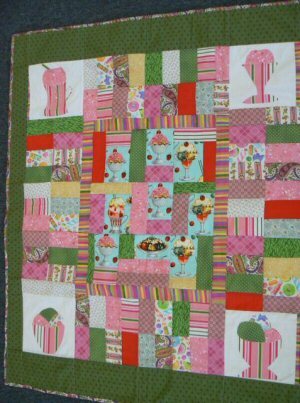 I took a look at all the quilts that you ladies made and the are all well done and the stories behind everyone of them are so interesting to read. It almost feels like that we were all in a huge room telling each others stories about quilting, friends and family. I have been busy as well and I have another picture for show you. This one is called "A Day at the Zoo". It was fun to make and the prairie points are a lot of work but at the end the results are a conversation piece to many. This one was made for grandson. I really believe that babies should get to know animals from an early age. This is why I have chosen this fabric. I wish all of you a wonderful end of Summer and as always, I'm looking toward looking at your creations and your wonderful letters. 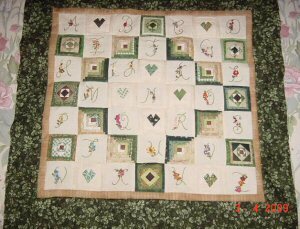 These are a few of my mini quilts that they are handmade and I continue to make them, however, not as often as I used to. 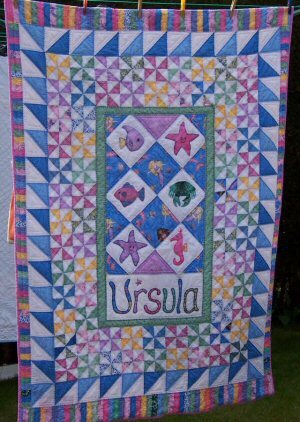 The story of those little quilts began in 1985 when I lived in Modesto California. I had my joint frozen and could hardly move, the doctors could not find anything wrong with me and ended up sending me to a mental clinic. After waiting one hour to be seen, I got impatient and I left. I spent my days sitting in front of a TV. watching a woman making these humongeous quilts and quilting by hand on on huge hand held frames. I had never made a quilt before, but I decided to do that and bought a copy of MINI QUILTS mag, fabric and embarked on what became an obsession, mini quilt making. Cutting fabric with scissors, piecing by finishing by hand. I could not move, except from my elbows down without much pain. Walking was another story, a neighbor would do my grocery shopping. I did manage to drive to the doctor, virtually in tears from the pain. Finally one day a new doc examined me, found something as she felt my neck glands, called in another doctor, and after lab work etc, within a week I was diagnosed with thyroid cancer, which was removed, and I'm OK. I still make mini quilts. Editor Note: Velia would love to know the name of this quilt. It looks like Lover’s Knot to me. Eleanor Burns (Quilt in a Day) has a book on this pattern. This is a photo of a wall handing I made for my great grand daughter Amber who will be 3 in October. 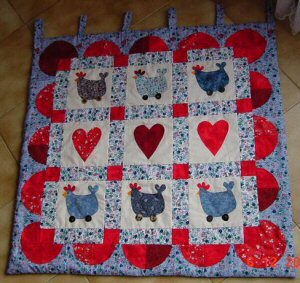 I have been patchworking for the last 12 years and my favorite is hand applique , but I must admit I like all things patchwork but not to keen on the quilting. It's a means to an end I do as little as possible to make sure it all holds together, but I must admit I never leave anything unfinished I have to qulit how ever much I do not want to if I did not there would be no point to it would there. I went to a quilting retreat and there were women that were quite experienced and one young woman that was at her first retreatand wanted to learn how to make a quilt. In all the conservation she said all she ever heard were horror stories about what had happened to some quilts and she wanted to hear a happy story. I told her about my grandaughter that wanted a double wedding ring quilt. 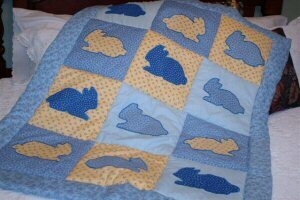 I volunteerd to make the quilt. I don't remember how long it took but when it was finished she showed it to her boyfriend and he proposed and they were married six months later. The happy couple have a boy 3 and a girl born on the 4th of July 2008. I have made 3 more quilts for weddings. I made this Dresden Plate last winter for our church dinner. One of the gals is helping hold the quilt up for the picture. I had to stand on a chair behind the quilt since I am so short LOL. Thought since you are doing a Dresden series I would share this. Yes, I have another quilt to show you . This one was inspired by the colours of Provence, I was looking at some fabric,in the blue and yellow shades and the idea came up, I had some toile in my stash that is now becoming huge. Talk about addictions, I suppose that mine is called Fabricolisms! Anyway aside from that I might as well keep on making quilts now that I have all this bounty, I called this quilt "Bunnies in the Window" when I look at this quilt it gives me a refreshed feeling, I think of my cousin who lives in Provence, France when I look at it, I kept this quilt just in case my grandson should come for a visit, I would have something to cover him up with if he took a nap. Honestly speaking I really enjoy this art of quilting! I feel free to express my taste by putting together fabrics and prints. Have a wonderful Summer quilting away! I was watching my 2 grandkids, it was naptime for Phoenix (3 yrs old), he would not go to bed, he could not find his little thermal blanky! I promised him that I would make him a new quilt. I finally got him to sleep and worked on his quilt, it was finished in a couple days. When I showed it to him , he did not want it, he wanted me to make him one with holes in it like his blanky. So I started to double-crochet him a blanket...it would take a few days or more! I told him I was going to give the quilt to one of the neighbor's grandsons. He said it was ok. The next day, he found his blanky in the toy box! I said, good, now I will make this crocheted blanket for his new baby brother in Sept.
Well, after giving the quilt to the 3 yr old little boy, I just had to make one for his 4 yr old brother too. I looked through my fabric for all that a little boy would like. It was done finally! I got the greatest feeling from giving them the quilts! Their eyes showed how happy they were, and I got a thank you, Mrs. Pat! It was so worth it!! Every stitch!! This is my very first quilt block. I'm in a beginner's quilting class. I know it is not perfect, but I'm okay with that right now. My 2nd quilt block is below the first one. I'm having fun so far. Variable Star (if I remember correctly). The pattern name for the 2nd block is Dutchman's Puzzle. I'm really proud of my color choices. I was at the fabric store a while ago looking for more fabric to make baby quilts, beside me there was a lady also looking for fabric, so we began talking and she told me that she was making quilts for many years and that I was going to get the BUG and she was right! It is now become an obsession with the making of quilts, I rather stick with the little ones for the simple reason that they are faster to make and the other is that I don't have on of those Mega Quilting machines, I find that quilting by hand is too hard on the fingers! I only hand quilt small panels. 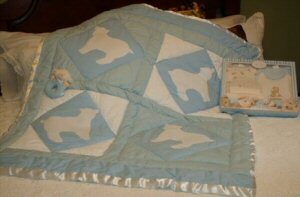 The quilt picture that I'm including is called "Soft as Lambs" reason being that when I was shopping for fabric I came across a piece of fleece ,when I ran my hand on it the idea of cutting the lambs shaped appliqués was perfect for this project. 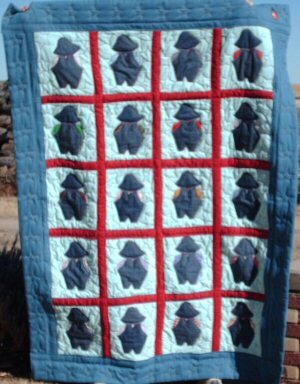 Therefore I would like to share this quilt with you all. Have a wonderful Summer! This lady was made for the town of Stony Plain, Alberta's, 100th anniversary. 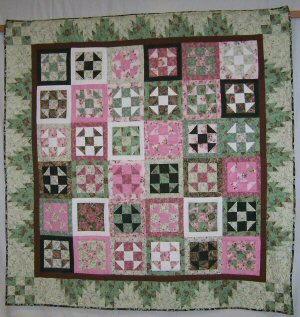 The County Quilter's Guild is sponsoring a Quilt Show to show off the hand work of the many talented ladies in the area during July, 2009. 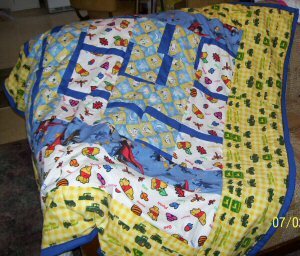 This is a quilt I made for our son Darrian. He was living in Boston for 6 years and working at Crossroads for Kids. 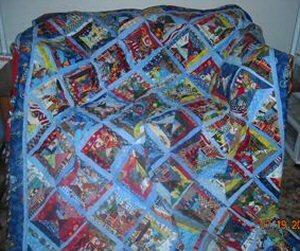 When he returned to Australia he asked me to make him a quilt from his old t-shirts. It was a challenge as the fabric was not exactly quuilting fabric. I reinforced all the pieces with vilene before piecing them. 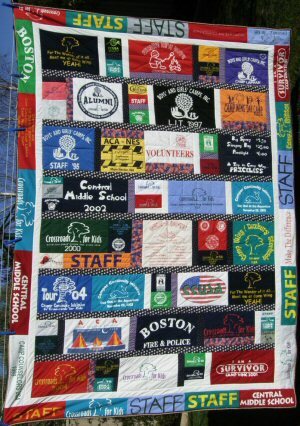 He loves the quilt and has a lasting memory of his wonderful times in the States and more particularly at Crossroads for Kids in the Boston area. 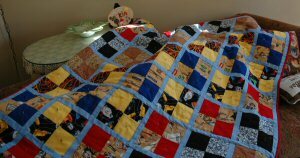 This is a handmade quilt, which I have created and sewed for my son. 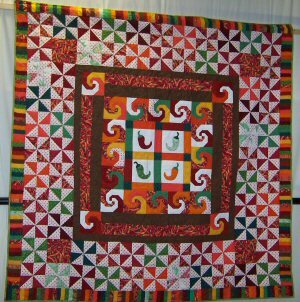 The name of the quilt is Senegal, because it is made with Senegalese cloths. I used to live there and I brought some cloths, as well as some clothings. My husband Jeffory and I have each finished our first quilt ever, they are not the best, but not to bad for country folks. We made our grandsons each a quilt for christmas, and now we are hooked on quilting. 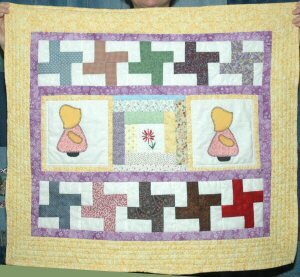 Shortly after finding out that we were going to be grand parents I decided to make quilts for the babies I say babies because 2 grandsons were on the way. 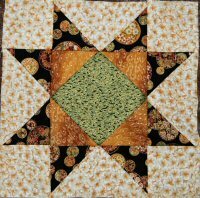 I joined the Victoriana Quilt Design a short time ago, I find that it's full of ideas, great designs and creativity from everyone. You are all a great source of inspiration to me, and I admire every one of you for the talent that you all have and I continue to see trough your pictures . I am a novice at quilting, but I really enjoy it! I find that fabric can be shaped into art . 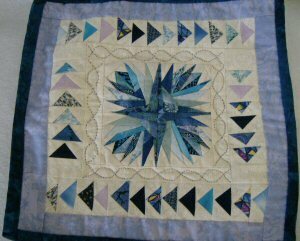 I have designed a quilt that I called "Starry Nights and Sunny Days" and I would like to share it with you , I love to work with appliqués . Like I said I 'm a novice at this and I 'm far from perfect , but I enjoy creating and making other people happy! 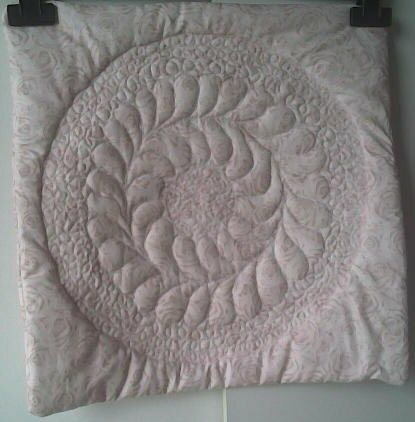 This picture is of the first quilted object I made from scratch. I read a few books and make the Christmas Tree Skirt. 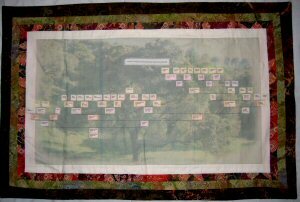 I’ve also completed one of four genealogy pedigree quilt projects I’m making for my children. I adopted two of my grandchildren. Since I am retired, I decided to home school them. I incorporate a lot into their curriculum besides the basics. This year I wanted them to start learning to sew. Back when I first started, we made nearly all of our own clothes. Now, kids wear mostly blue jeans. The girls are now 9 & 10, so I started them out just learning how to sew straight seams, thread the machine, etc. 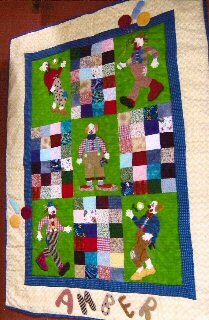 I saw a raggedy lap quilt and thought that would be just the thing. They could do it and feel proud of something beautiful. We gathered up flannel scraps and old flannel sheets to cut into six inch squares. It was a great success. The "not so exact" seams were very forgiving of the first-time sewers. 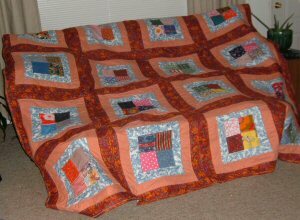 It was soft and just the right weight for a lap quilt. The ragged edges turned out so tactile, just perfect for their 83 year old Great Great Aunt that they sent it to for Christmas. Now, they want to make more of these soft flannel lap covers for other folks in their favorite nursing home. It is finished. Measurements: 96 inches by 110 inches. Quite a job, but if they can use it on their bed the rest of their lives. Thank God I was able to do it. I'll be 80 years old April 27. 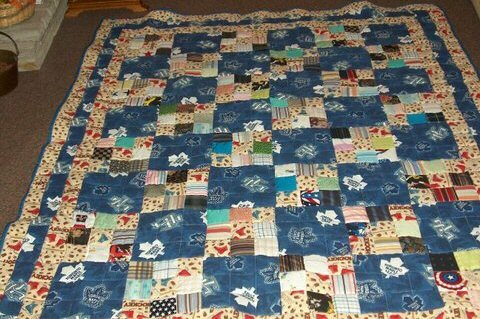 My grandson is a Toronto Maple Leafs fan so I made him a quilt with the Maple Leafs Logo as the main block. 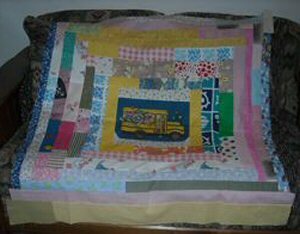 I am disabled, and still love to sew and make what I call simple, crazy, scrap patch quilts. 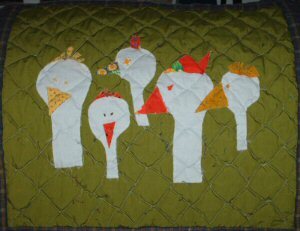 To make use of my scraps of material, etc., I just decided to make each of my family members a quilt. Some of them weren't from a pattern or just old scraps. I have 4 sisters, 3 daughters, and 6 grandkids. And they each got a special made quilt from me. 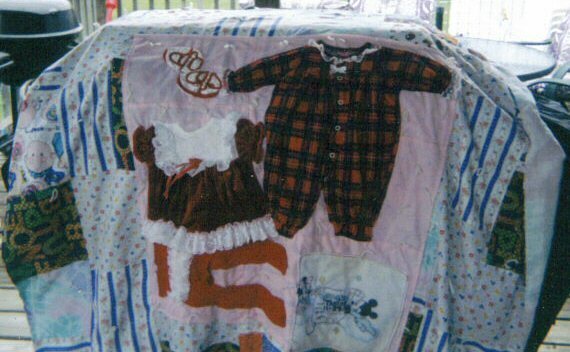 My two oldest grandkid's quilts, were made using some of their baby clothes! 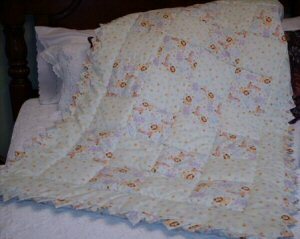 I also made alot of Preemie 18x18" baby quilts for a Charity group, along with hats,booties,and Presentation pouches. 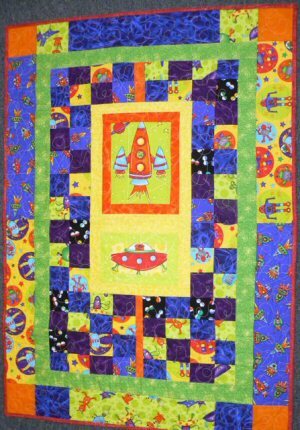 I am fasinated by pretty, unusual quilts! And beauty is in the eyes of the beholder! !